Toyota's recall of 385,000 Lexus IS sedans comes in the same day that the automaker recalled 907,000 Toyota Corolla and Matrix vehicles over an airbag issue. 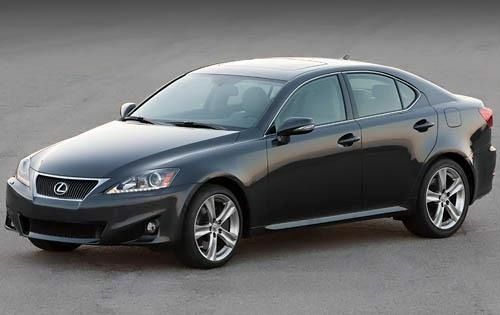 Lexus has announced that it is voluntarily recalling 385,000 model-year 2006 to 2012 Lexus IS vehicles due to a windshield wiper defect. Affected vehicles, which were manufactured between May 2005 and October 2011, may contain insufficiently tightened wiper arm nuts. Consequently, heavy snow build up on the windshield may cause one or both of the wipers to become inoperative. Not surprisingly, visibility may become obscured, thus increasing the risk of a crash. The recall affects 270,000 vehicles in the United States and 17,000 vehicles in Canada, while the rest were sold in Europe, China and the Middle East. There were 25 reports of problems related to the windshield wipers, according to Toyota. Lexus has not released an exact recall schedule, but did state that it plans on notifying customers in the “near future.” Authorized Lexus dealers will repair affected Lexus IS vehicles free of charge. In the meantime, customers can call the Lexus Customer Satisfaction Hotline at 1-800-255-3987 or go to the www.lexus.com/recall for more information. Concerned drivers can also contact the National Highway Traffic Safety Administration’s Vehicle Safety Hotline at 1-888-327-4236 or visit them online at www.safercar.gov. Lexus’ parent company Toyota announced a separate recall earlier in the day involving 907,000 model-year 2003 and 2004 Toyota Corolla sedans and Toyota Matrix hatchbacks. Affected models may have been manufactured with application-specific integrated circuits that are prone to internal shorting. In some cases, the internal short may create an irregular current flow and an extreme build up of heat. The excessive heat could damage the circuit, which may result in sudden airbag an/or seat belt pretensioner deployment. The recall affects 752,000 vehicles in the United States while the remainder is located in Canada, Mexico and Japan. The pair of recalls is not exactly a step in the right direction for Toyota, who led all automakers last year with 5.3 million in vehicles recalls. In fact, Toyota recalled over 1 million more vehicles than Honda, which was second with 3.9 million vehicles recalled. To make matters worse, Toyota also recently agreed to pay more than $1 billion to settle lawsuits where vehicle owners said their vehicle’s value plunged after the company recalled millions of vehicles due to sudden-acceleration issues. In total, the automaker recalled over 8 million cars, trucks and SUVs stemming from the unintended acceleration problem. The lawsuit is the largest-ever auto civil settlement in history. On a positive note, Toyota announced earlier in the week that it sold a record-breaking 9.748 million vehicles globally last year, recapturing its spot as the world’s top automaker from rival General Motors.